Form No. 1-100 - 17.11.11. 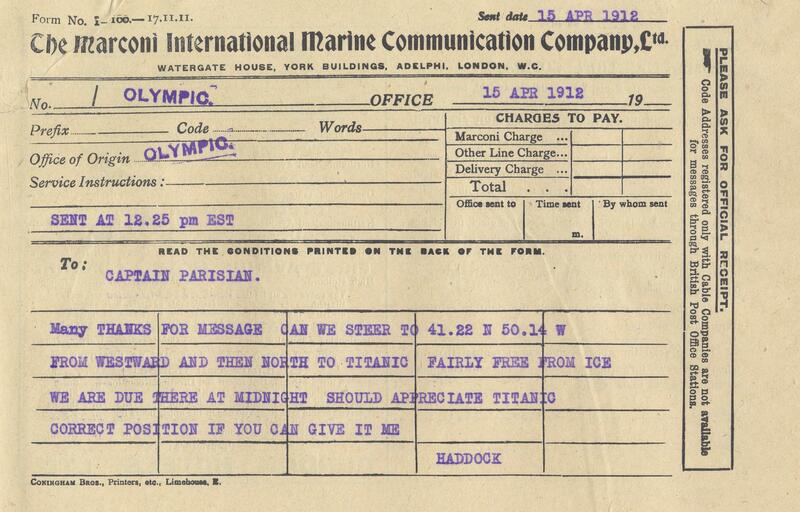 Sent date 15 APRIL 1912. No. OLYMPIC, Office of Origin OLYMPIC. Service Instructions : SENT AT 12.25 pm EST. To : CAPTAIN PARISIAN. Many THANKS FOR MESSAGE CAN WE STEER TO 41.22 N 50.14 W FROM WESTWARD AND THEN NORTH TO TITANIC FAIRLY FREE FROM ICE WE ARE DUE THERE AT MIDNIGHT SHOULD APPRECIATE TITANIC CORRECT POSITION IF YOU CAN GIVE IT TO ME. HADDOCK.